Honen: Okay, class, who can tell me...What happens when irresistable force meets an immovable object? Honen: Ah, yes, desert-elf...I mean, Mr. Paladin. Can you tell me what happens when an irresistable force meets an immovable object, yes? Honen: No, no, someone else, por favour? Lukyan: Why don't we find out? Wait until Nucleo falls asleep on the floor and tell Tomi there's a powdered donut underneath of him. Honen: No, no, no. It iz an inconceivable event. A paradox. If there exists an irresistable force, there cannot be an immovable object in same universe. Understand? Honen: (dummes Wüste Geschöpf) *ahem* Okay, moving on next question. Can someone tell me what happens when you mix equal strength acid with base? Honen: ... Yes, Mr. Paladin? Honen: You are starting to test my patience, desert-elf. Honen: They cancel each other. Dat's what happens. Allright, can anyone tell me what happens when you divide by zero? Chester: Dude, I think I know this one! Chester: Ummm...ummm...wait, I just had it...uh, dude...I know I've got the answer here somewhere....oh yeah, that's it! Universe implosion! Chester: Dude, am I right?. Honen: NO YOU ARE NOT RIGHT, YOU STUPID HILLBILLY!!! Chris: Oh! Oh! I've got one! Why did the chicken cross the road? Lukyan: I give up. Why? Christopher: To escape the imploding universe. Chester: Dude! I've got one, too! Why did the girl tiptoe past the medicine cabinet? Christopher: C'mon, man, don't leave me in suspense! Chester: Dude, she didn't want to make the universe implode! Honen: Dumme unwissende Affen!!! Shut up!! I should fail every one of you! Honen: Why you think? I make you take test. You answer every question with "Universe Implosion"! You pay no attention to lessons, books...anyting! Christopher: Give us a break. 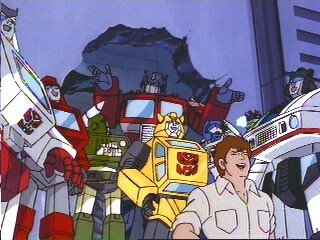 There are a million things that can cause the universe to implode in an 80's cartoon. Honen: The 80's were two decades ago, you stubborn moron! Christopher: So? Have they invented some kind of universe implosion-stopping technology since then? Honen: In 80's, things were different. Lots of bad science made its way into cartoons. Rubber tires protect you from lightning. Getting hit on head causes amnesia, getting hit again restores memory. Hogwash! Just watch ze Legend of Zelda cartoon - physics apparently don't exist in dat universe. Horizontally, with tail straight out, never touching ground. See? Chester: Dude, but what if like...the dinosaur tried to stand up vertically, so it could like, reach something higher than its head? Like from a tree? Chris: It would cause a rift in the space-time continuum as the ideals of the 80's, 90's and 65 million BC collide, resulting in a universe implosion the likes of which could only be matched by unlocking the All-Bonds Mode of Goldeneye. Lukyan: Damn. Is that the real reason they had to take it out? Christopher: Yup! Too many Bonds in one spot = universe implosion. Honen: I think I'm going to quit teaching zis class before I run out of appropriate emoticons. Honen: What is it, Mr. Paladin? Christopher: If you don't like the way the sketch is going, just reverse the polarity. Honen: Trust me, desert-elf, of all ze stupid 80's cartoon logic, dat iz ze one I most wish actually worked. I'd like nothing more than to reverse your polarity and make you all intelligent beings instead of ignorant monkeys dat you are!! Chester: But, dude...wouldn't you have to like...tune into our frequency to do that? Lukyan: No, that's only if you're possessed by a demon. You have to take two proton beams and tune one to the person's frequency and one to the demon's frequency to separate them. Honen: Zis is ridiculous! PEOPLE DO NOT HAVE A FREQUENCY!! Christopher: Actually, I agree with Honen on that one. Even if we did have a frequency, there's no way to test it. Christopher: Because if a demon and a human tried to occupy the same space at the same time, it would cause a universe implosion. Lukyan: Oh, come on. People can too get possessed by demons. Certainly you're not forgetting all the times it's happened to RAU characters, including yourself. Christopher: Well, that would explain all the universe implosions we've been having lately. Chester: Dude! If the universe keeps imploding, why are we all still here? Christopher: Don't you know that the first law of cartoons is that no matter what happens during an episode, things always go right back to the way they were at the beginning of the next episode? You find a pot (or skull-shaped pot) in a room. And you pick it up. Then you throw it and break it. And when you come back, it'll be fully-reformed! Christopher: Two words: Reverse polarity. Lukyan: Maybe someone should reverse Honen's polarity to get him off the floor. Chester: Dude! I'll do it...Uh, does anyone know his frequency? Honen: Gah! Do not touch me, you incompetent oafs! I am fine now! Just fine! Christopher: You know what else is great about 80's cartoons? The way everyone just laughs and laughs and laughs at the end of the episode to fill up the last few seconds, even if nothing funny happened. How long is he going to go on like dat? Zumo: It's been two days and counting, friend.